Ultimate College Softball > Categories > Beyond College Softball > ISF pitching rule change. Does anyone have further info on the following story? Does it affect ISF Women's, and Juniors as well? This appears to be a knee-jerk reaction to foil a talented Aussie male pitcher who is without question the top pitcher in the game. Would be interested in any comments adding to the info that appears below. Discussion on the issue going on over at the Sask Jr. Dbacks board. 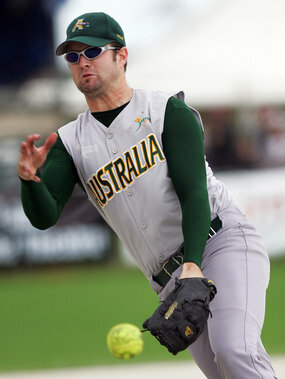 The international career of one of Australia’s top male softballers hangs in the balance after the sport’s governing body changed the rules due to his dominance. Adam Folkard was one of Australia’s stars in the Steelers’ International Softball Federation (ISF) World Championship victory over New Zealand last year. Folkard was so dominant that he pitched a no-hitter to end the Black Sox’ reign as world champions. Responding to concerns from rival countries that Folkard’s pitching was limiting the role of batters, the ISF changed the pitching rules. The rule change only affects international softball, meaning the ACT-born pitcher can still play for his club team in the US but, as a result, Folkard has been effectively been stopped from playing for Australia. He is not only the most dominant pitcher in softball but also one of the fastest, with recorded delivery speeds of 130 kilometres an hour. In essence, the key to Folkard’s success has been his ability to disguise his delivery rather than his speed. The new rules effectively prevent pitchers from shielding the ball from the sight of batters, and they appear to be a deliberate attempt to blunt Folkard’s influence on the sport. The pitcher himself has played down the notion the rule is solely to lessen his impact from the mound. “There’s a fair few people overseas, especially in American clubs in the club league there, that all pitch the same way as well,” he told Grandstand. “People say it’s because I was dominant at the worlds but I had a good game just like they could have had a good game. But Australian men’s head coach Bob Harrow said there was no doubt in his mind that the rules were modified to rein in Folkard’s dominance. “There is a lot of pitchers in the world pitching like he does now, and it’s going to hurt a lot of people,” he said. Harrow said inconsistencies in how the rules are enforced could be damaging for the sport, despite the changes being made to make games more entertaining to watch. “The bottom line is I don’t think even the umpires are completely aware about how the rules should be called yet,” he said. “I had a meeting with the umpires last night on the phone and they’re starting to take a look now because they’re going to lose a lot of ballplayers like Adam Folkard and we just can’t afford that. Folkard was selected in the Australian team to play New Zealand and Argentina in Canberra in December, but he has pulled out and his international career is now in jeopardy. He said he did not want to embarrass himself on the international stage by fouling out for his action. “There’s no point being in the team and taking up a spot when I won’t be able to pitch,” Folkard said. “Obviously it wasn’t an easy decision to make but it’s one I had to make. The Australian Softball Federation is hoping the international body changes its mind on the rule change. I want to slap the ISF. What, exactly, is the rule? What does this pitcher, and others, do that is so deceptive? Laffy, that is the way I read it too. Something brand new and yet I will swear that I have been watching pitchers (especially Kiwis) do this for the past 30+ years. Yea... this would be like telling quarterbacks they now must play with one arm tied behind their back because of what Brady, Manning, and Brees have been doing to NFL defenses the past 4-5 years. The video looks to me like many pitchers I have seen, and it is legal according to the men's rules currently. I do believe that the Kiwis started the "hide the ball" motion, and it appears perfectly legal to me. The old figure eight pitchers did the same thing 40 years ago. My 12 year old saw this video and basically looked like a deer in the headlights. She was like oh my gosh Daddy. Where the heck was the ball? Frank, do you remember Dennis Amell from the 70's and 80's? He was from Niagara, Ontario (Niagara Falls) and pitched also in St. Catharines before moving to the eastern U.S.
We called him Spiderman because of his motion which was a combination of figure eight and slingshot. No one else used it. It looked like he had two teachers, perhaps his father and then a coach who taught him slingshot. Anyway he looked like someone who wasn't certain whether he wanted to throw figure eight (orthodox, we called it) or slingshot, which was big in the Niagara area. Your reference to figure eight made me think of Spiderman Amell. Thanks. 10-4 - I remember the name, but I don't remember pitching against an "orthodox" pitcher ever. I threw orthodox but taught windmill. This could really upset the the ISF fans.....all 10 of them. I know we are supposed to watch the pitcher, but holy cheeseballs that catcher is tall. Can we inact a Yukiko Ueno rule too. She seems to be beating us too often, as well. I have watched the video about ten times and still cannot figure out what the problem is. I see a legal pitcher by men's pitching rules standards. Same here. The guy does a great job hiding the ball but it's not clear to me how a rule could be written (that would be consistently enforceable) to prevent this. No hiding, no pausing. David copperfield, Ricky Jay, and penn & teller are kicked out of th pitching circle.